I haven’t made any mince pies this year, and I think I’ve only actually eaten one, and that was mediocre at best. It tasted of stale carpet, and Marks & Spencer really should try harder. This is a disappointing situation, so I did something about it. Here’s a very quick and simple recipe that uses the bulk of the ingredients that go into a normal mince pie, but arranges them in an alternative fashion. It’ll catch on, you just watch. 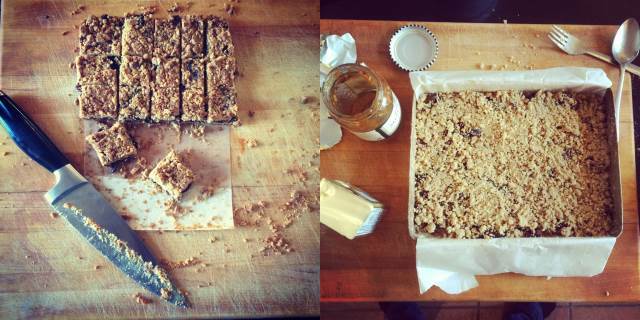 The basic idea here is that mincemeat is sandwiched between a biscuit-like base and a crumble topping, and then sliced up into little bite-sized squares. It’s a wonderful little riff on the boring old mince pie, that captures the same types of flavours, but with a radically different texture, and not at all like stale carpet. The same … but different. Here’s a challenge – this recipe is so quick that you can get everything done and ready to go before the oven comes up to full temperature. GO! There’s a little trick in the mix – beurre noisette, or burnt butter. This is simply butter that’s been melted and allowed to roll into a boil until the water it contains has evaporated away and the fat has darkened to a dark brown colour. The butter has a distinctive and delicious smoky and nutty taste that adds a whole extra dimension to these little cakes. Use 150g of unsalted butter, and melt, then boil it carefully until it foams and then turns brown. Pour it quickly into a cold bowl to stop it cooking and completely burning. The base and topping are made from the same thing – 150g of plain flour, 125g of ground almonds, half a teaspoon of baking powder, and a pinch of salt, sifted together into a large bowl, with the beure noisette added and mixed in to form a rough dough that resembles the type you’d use as the base of a cheesecake. Tip half the mixture into the lined tin and press it down in a firm and even layer, then add a 400g jar of mincemeat and spread that out evenly, too. You may have made your own mincemeat, in which case, well done, but for the rest of us less organised people, a decent shop bought jar is fine, especially if you perk it up with a little rum, and maybe some more chopped nuts. To make the crumble topping, rough the remaining mixture up with a fork until it looks like, well, a crumble topping should look, and spread this over the mincemeat, gently patting it into place with the fork. Bake for twenty or twenty-five minutes, then let the tin cool completely before lifting the contents out and slicing into squares, as big or small as you like. This recipe comes from the brilliant Poires au Chocolat, and it’s an inspired idea. I love to make little mince pies, but for times when I’m not in the mood for that much work this would be lovely! 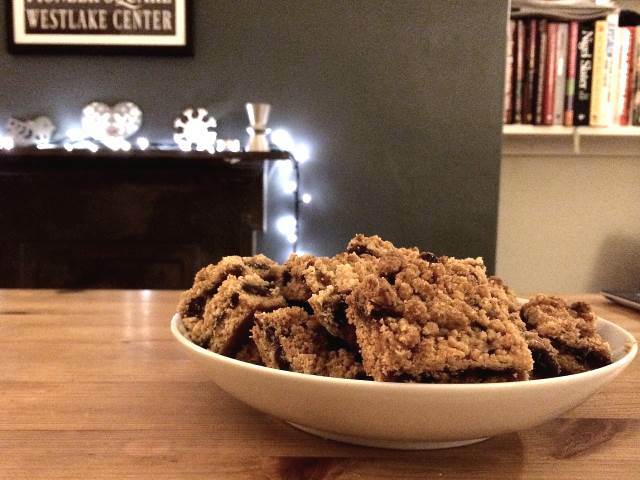 I make something very similar — date bars — and am certain the mincemeat would work well.